33 God is my strong fortress. He makes my way perfect. 34 He makes his feet like hinds’ feet, and sets me on my high places. In today's promise, we read of King David's declaration of God's faithfulness after he was delivered from the murderous pursuit of his father-in-law, King Saul. He proclaims to everyone who will hear, that God is his strength and power and makes his feet sturdy, like the sure footing of the deer who climb the mountaintops. 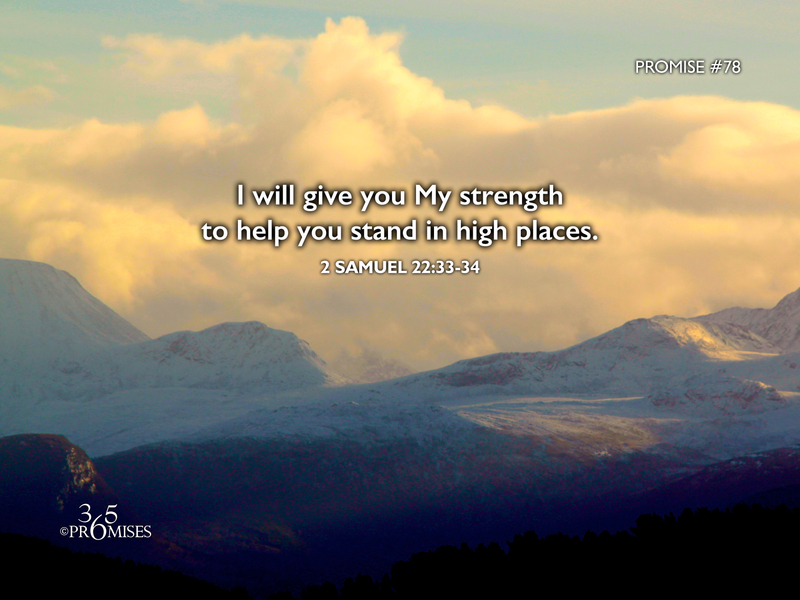 With God on our side, we are able to climb to great heights knowing that He will help us stand firm in the highest of places. We have nothing to fear. He is able to keep us from falling. May our God and Father strengthen you and give you the sure footing you need today, no matter what obstacles you face, so you can reach great heights in His loving care.